December 10, 2014 by Ecommerce News. About Logistics with tags The Netherlands. 4250 views. Dutch pick up service De Buren (“The Neighbors”) has closed deals with DHL Parcel and TNT, as a result of which these parcel delivery companies have 50 extra unmanned pick up locations throughout the country. DHL Parcel was only just starting with placing their own locker systems, following Parcel4Me and market leader PostNL. The automatic parcel stations from De Buren consist of lockers where customers can pick up or deliver their goods 24 hours per day and 7 days per week. By using these locker stations DHL Parcel is expanding the possibilities for its customers to decide where and when they want to receive the goods they ordered online. The lockers of De Buren can also be used as a return point, but only if the corresponding online store offers that option. The locations from the De Buren stations complement DHL Parcel’s own stations and its thousand manned DHL Parcelshops. 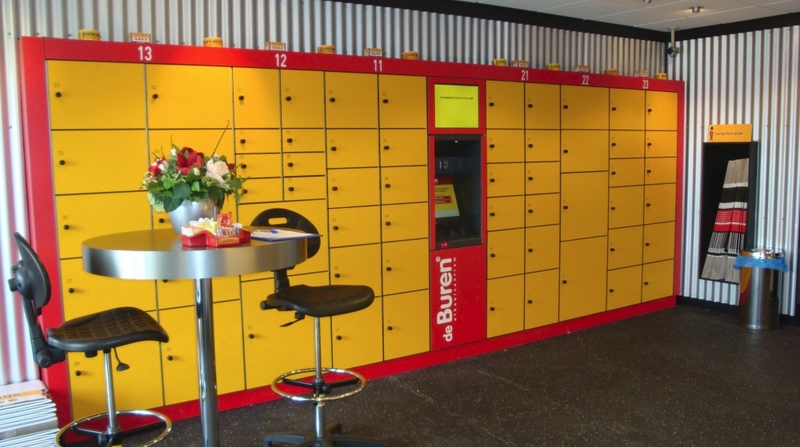 Also this week De Buren announced a partnership with TNT, where the Dutch company offers its 50 unmanned locker stations to customers from TNT. TNT Innight, which handles shipments at night, will use the De Buren points as it delivers time-critical goods to thousands of addresses and customers now are able to choose when and where they pick it up. De Buren is working hard to expand its network of unmanned locker stations drestically. The lockers are not only being used by ecommerce companies, but also by offline retail solutions, like pharmacies and dry cleaners.